A painting must be free to wander. The best works are those that seem to simply happen. I love this quote by Michael Cutlip. Years ago, I was carving a marble sculpture, creating a hole through the piece that was emerging as an abstract heart, when the chisel slipped. The solid form broke into three pieces. I gasped: “Oh no!”, and some other things I can’t print here. I thought I had ruined it. I’d spent hours chiseling away on my sculpture only to destroy it near the end. Just as I was about to throw it away, something in me looked back at the assemblage of three pieces lying on the table. Suddenly, I saw something emerge. My vision shifted. I saw three intriguing sculptural pieces that could be assembled and reassembled endlessly. Combinatorics. It was like molecules mixing and combining in the primordial soup of creation. I realized that this “accident” was fortuitous- the piece was now more interesting than the original one I had been creating. This one had an element of surprise in it, and the ability to be combined and recombined in infinite ways! Something magical had happened in this accident. If I had stayed with my intellectual mind, the piece would be gone forever in the trash bin. I think as artists we’re continually facing these moments when we feel we’ve ruined the piece we’re working on. Our mind says one thing and our heart says another. Will we allow our heart to speak? When we’re deeply creating, we’re accessing the creative impulse. Unfamiliar, raw and embryonic forms are trying to be birthed in our art, yet this emergence of new work may be subtle and easily missed. These shifts, these twists and turns, lead us into new territory- yet we may dismiss them. Let’s not miss the moment. Stepping in the unknown, embracing uncertainty is where we want to go as artists. This is how our art evolves. A bluebird flew into my life last Monday. The Artist’s Journey ©2018 by Nancy Hillis, MD | An inspiring exhortation with psychological and philosophical underpinnings to move you closer and closer to your deepest self expression in art and life. 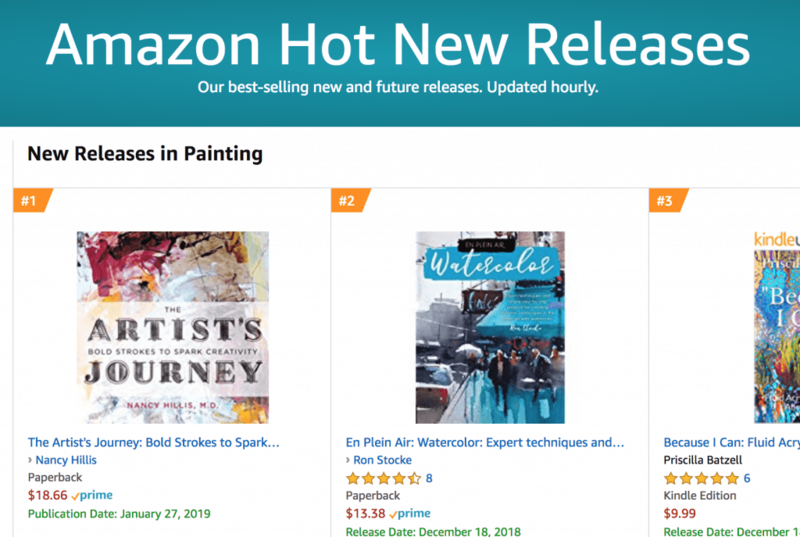 I was uploading The Artist’s Journey, my new book, onto Amazon for its January 27 debut, but to my astonishment and lack of knowledge of the deep inner workings of Amazon Kindle Direct Publishing, the book went into pre-order status and unleashed a flood of activity. At first, I gasped wondering if I had broken something and completely ruined our first book launch. But then, I realized that what was happening might be enormously beneficial. I found out about this turn of events when an artist excitedly exclaimed to me on Facebook that she had pre-ordered the book! I went onto Amazon, looked myself up and sure enough, there it was! Then, today I got two big surprises. The book came in ahead of bestsellers: Big Magic and You Are A Badass Every Day! 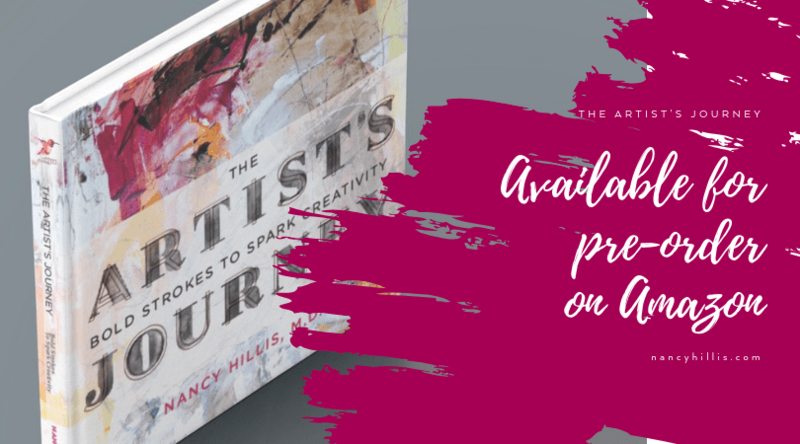 Since the book went “live” I started our book launch team and we have over 150 artists who raised their hands to get the word out about The Artist’s Journey book. We need all the support we can get, since we’re like David facing Goliath with his publishing house and robust marketing machine. P.S. You can pre-order your copy of The Artist’s Journey >>>> HERE. Hey Raymond! Thanks so much! I am searching everywhere for a means to contact you, questions about classes and stuff to tell you. In your “contact” section on the website I do not see any place that shows me how to contact you; this is as close as I got. Thank you. Thanks so much for reaching out to me. I’ll email you now. Thank you so much Danny!!! I don’t have a say in what part of my book is available for preview.